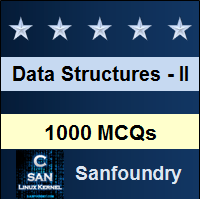 This set of Data Structures & Algorithms Multiple Choice Questions & Answers (MCQs) focuses on “Comb Sort”. Explanation: Comb sort compares two elements at a variable gap from each other in each iteration unlike bubble sort where the gap remains 1. This reduces the average time complexity of comb sort. 2. The gap between two elements being compared shrinks by a factor of _______ after every iteration. Explanation: It has been found experimentally that the gap between the two elements should shrink by a factor of 1.3 after each iteration for the most efficient sorting. Explanation: Initial gap is taken to be equal to the number of elements in the array and shrinks by a factor of 1.3 in each iteration, initial gap is independent of the number of iterations and compiler being used. 4. What is the worst case time complexity of comb sort? Explanation: Worst case complexity is observed when the input array is reverse sorted. This is same as the worst case complexity of bubble sort. Explanation: Initially the gap value will be 6. For the first iteration, it will be 6/1.3=4 then 4/1.3=3 for second iteration and 3/1.3=2 for the third iteration. Explanation: Auxiliary space used by comb sort is O(1) as it does not use any extra space for manipulating the input. Explanation: Comb sort takes 1 iteration less as compared to bubble sort as it makes use of variable gap value whereas bubble sort uses a constant gap value of 1. 8. Comb sort is a stable sorting algorithm. Explanation: Comb sort is not a stable sorting algorithm as it does not sort the repeated elements in the same order as they appear in the input. 9. What is the best case time complexity of comb sort and bubble sort respectively? Explanation: Best case complexity for comb sort and bubble sort is O(n log n) and O(n) respectively. It occurs when the input array is already sorted. 10. What is the advantage of comb sort over merge sort? Explanation: Comb sort does not require auxiliary space for manipulating input so it is an in place sorting algorithm but merge sort does require O(n) of auxiliary space which makes comb sort better in terms of space complexity.